All I wanted for Christmas this year was an Instant Pot, and I’m so glad I got it! In fact, I cheated and used it to make some great stuff on Christmas Eve. If you haven’t heard of Instant Pot, it is a magical electric pressure cooker, slow cooker, rice cooker, steamer, and yogurt maker in one. You can also use it to saute before you apply pressure or let it cook slow and low! Being the techie I am, I of course has to get the Instant Pot Smart, complete with Bluetooth capability and app. After the standard Instant Pot water test, I made a great sweet potato and carrot soup, and some rice. 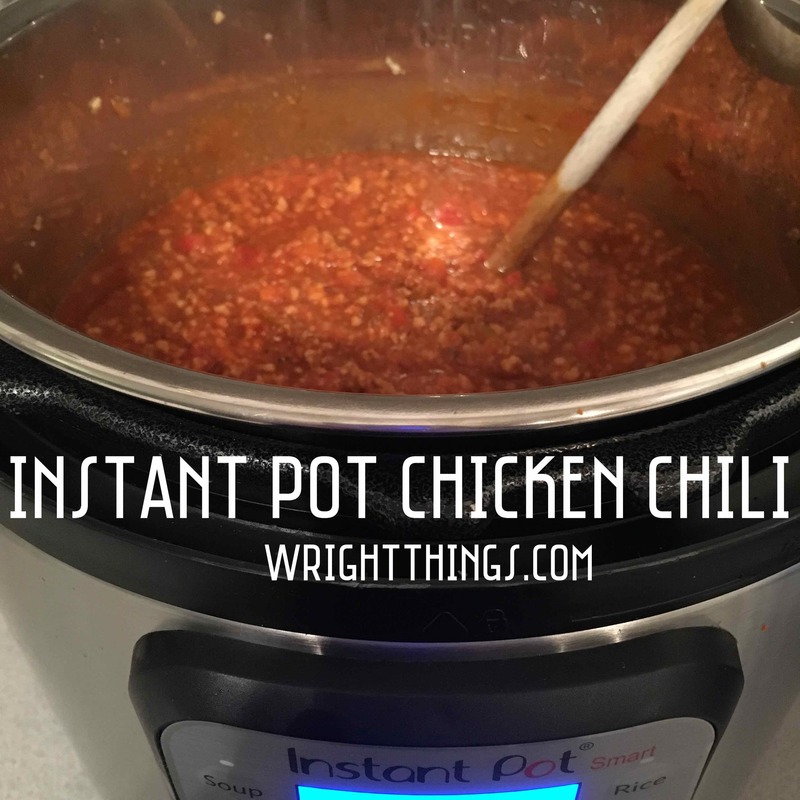 One of the things which had me the most excited about the instant pot was the prospect of Instant Pot Chili. Who doesn’t love chili, especially when it can be cooked in a fraction of the time? 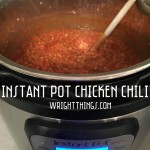 Lately, I’ve been a huge fan of Chicken Chili., and I figured I would give it a go in my Instant Pot. It took me a while to warm up to the idea of Chicken Chili, but once I made it, I was hooked. As a bonus, I used my Vitamix to chop all the vegetables and make the ground chicken chunks a little smaller. As a bonus, this Instant Pot Chicken Chili is also gluten free, dairy free, and free of the top 8 and 11 allergens. Vegetable and ground chicken chili, a lighter alternative to beef chili. Also top 8/top 11 allergen free. Heat olive oil in skillet. Once oil is heated add ground chicken to skillet to brown, chopping and stirring frequently, as ground chicken does not contain much fat and will stick much more than ground beef. Dice all vegetables, by hand, food processor, or Vitamix. Set Instant Pot to sauté, and add diced vegetables and spices, stirring every few minutes. Once chicken is browned, it can be added to the Instant Pot. Depending on how you like your chili, you may want to pulse the browned chicken in a food processor or Vitamix, or chop it more finely before adding to the chili, it does not break up as well as ground beef. Add canned tomatoes to instant pot and stir. Add an additional 2 cups of water to Instant Pot and stir. Set instant pot to 8 minutes manual. Instant Pot will automatically begin to build pressure, then cook 10 seconds after setting. Instant Pot will count down time remaining once pressure has built. Allow pressure to release naturally, and enjoy. 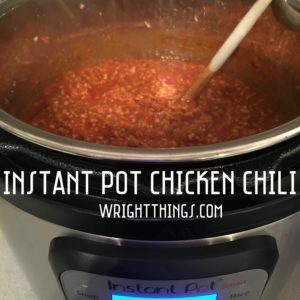 Instant Pot will switch to Keep Warm once cooking is complete, keeping the chili hot until you are ready to serve it. Remember to safely switch Instant Pot from sealing to venting and ensuring pressure is released before opening. Remember, while the total cook time is 8 minutes in the Instant Pot, it will also take time for the pot to come to pressure. Since we used the sauté function and heated everything up, it took about 10 minutes to come to pressure. After cooking, make sure to wait at least 10 minutes to allow some of the pressure to release naturally, before releasing the rest. I waited until I was ready to serve the Chili, about an hour, since the Instant Pot will keep warm, and all of the pressure was released from the pot.